Well of course you can eat them fresh, or puree the flesh and make a smoothie with yogurt or milk and a sweetener as follows: Blend 300g (10 ounces) guava flesh (seeds included) with 2 cups chilled full-cream milk, 2 tablespoons vanilla sugar, 1/3 cup sweetened condensed milk and some ice cubes. You could also make a Fool, and old English fruit cream. This is my favourite. Pass two cups of ripe guava flesh through a seive, fold through the strained juice of two limes and two cups of lightly whipped cream. Pour into tall dessert glasses and serve immediately. 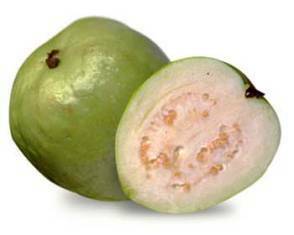 Or you could make a guava jam or chutney.